If you’re going to invest in a pour over brewer, many would recommend that you make it a Hario V60. 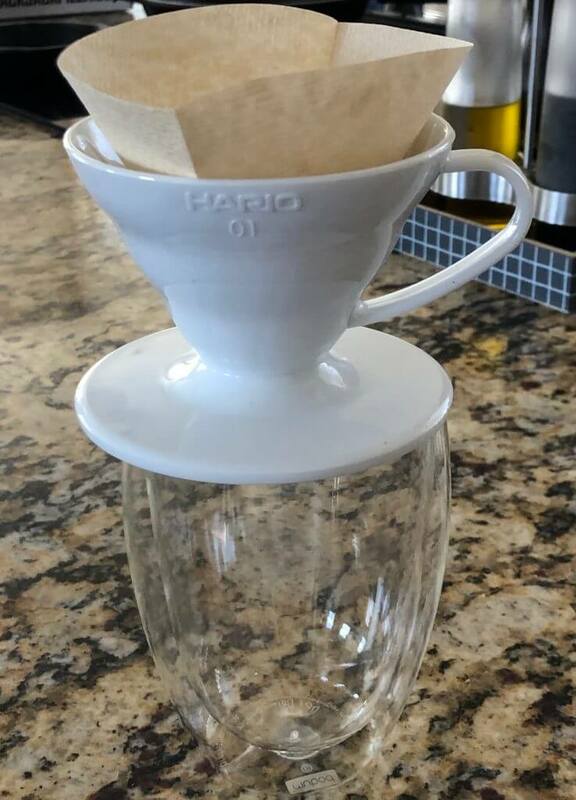 We agree, the Hario V60 pour over is one of the best cups of coffee you can make, and a single cup brew is quite easy if you have a Hario V60 01 (that’s their smallest, single-cup size). Because we’re well aware of the hassles of recipe sites (too much story, too little ingredients and steps), we’ll put our recipe first (after modest but necessary preamble). 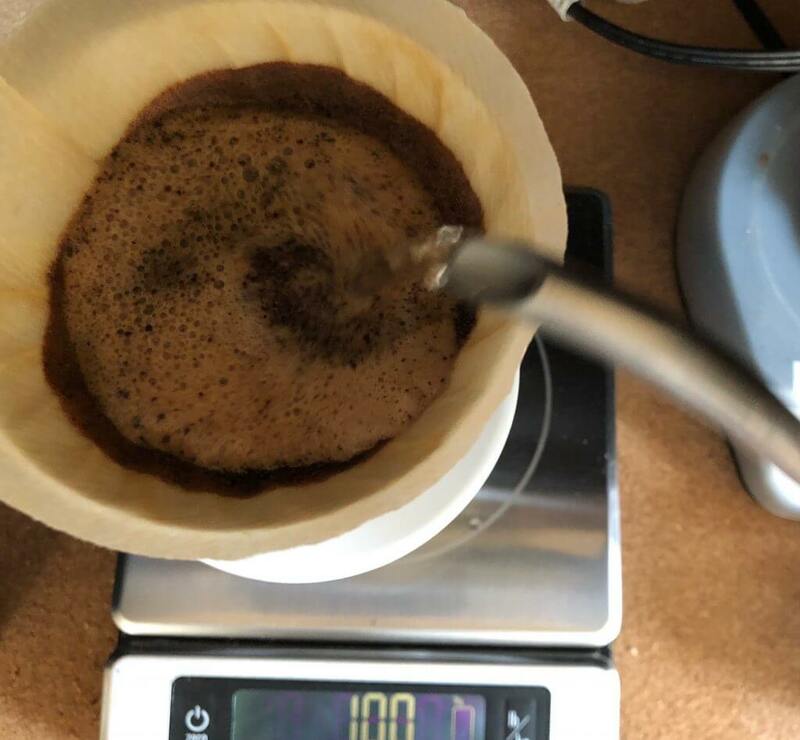 If you want the summary version of why a V60, how it compares to other coffee brewing methods and more, that’ll start half-way through. The heart of coffee brewing, and our Hario V60 recipe is going to be the brew ratio and grind size. If you know those (and understand what they mean and how to use them) the rest is silly details. For more about ratios, jump to that section in our explanations section. I’m bad at giving names to sizes. “Sand” size? Kosher salt? For the Baratza Encore, we use the 16 grind size. This is a little bigger than what we use for the AeroPress, a little smaller than what we use for the Kalita Wave. The ideal grind for your Hario V60 Recipe will depend a lot on your grinder. Don’t just apply this 16 setting to your own. 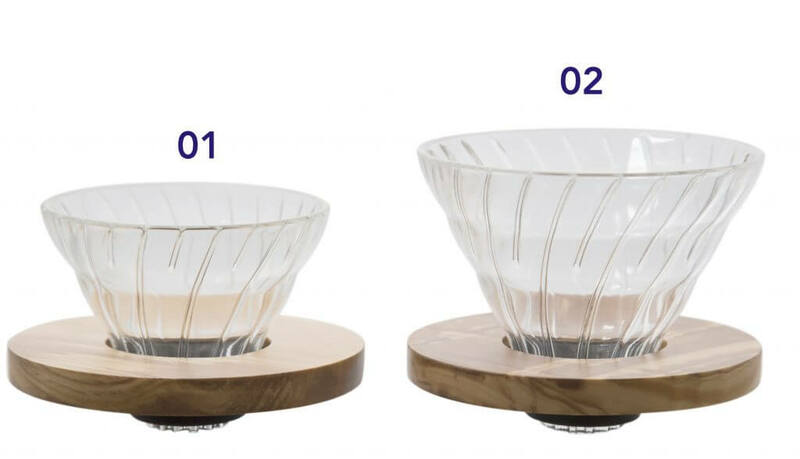 Because the Hario V60 is so common, if you check your manufacturer’s recommendations, you should see some setting combination they recommend. Start there and then hone in if you don’t quite love it. 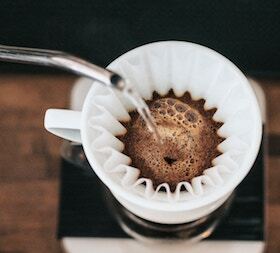 Alright, time to get to the heart of our Hario V60 brew guide. We’ve kept you waiting long enough, and delicious coffee awaits! Prepare your brew-stack. For me, with a Hario V60 01, that’s almost always a scale, topped with a double-walled glass mug, my plastic Hario V60, and then my filter. If you’re brewing for many, you’ll probably put it above a pitcher (or carafe, if you’re fancy) of some kind. 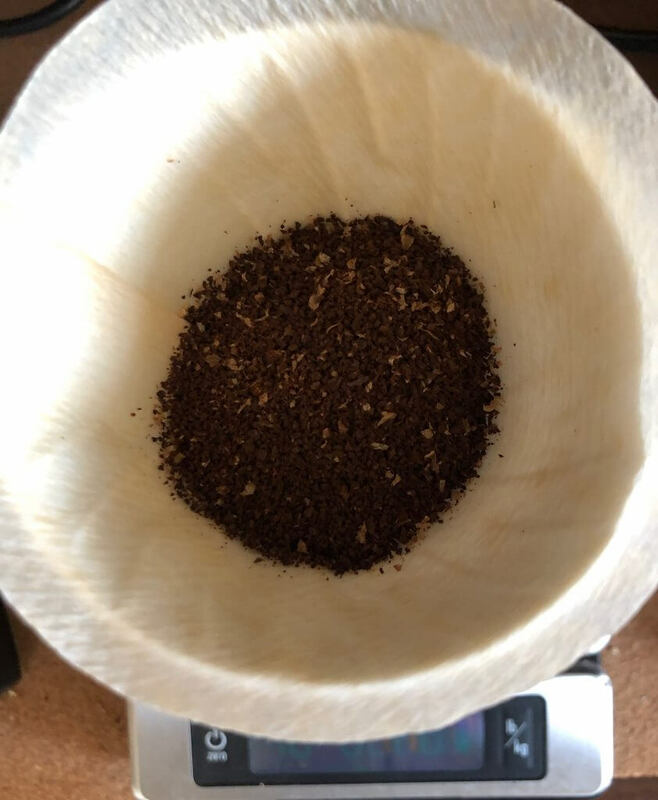 Throw out your water, and add the ground coffee to the filter. I always double-check my ground-coffee-weight here by taring the scale before this step, and after, but that’s a little excessive. Zero-out (tare) the scale, and bloom your coffee. This means pouring a little water (50-90g) over the coffee, and stirring with a spoon (or in my case, a AeroPress stir stick). Again, stirring isn’t required, but most people who I’ve consulted on this matter think it’s good but fussy. Now wait a bit to make sure all the ground are saturated. Now, pour the rest of your water volume. If your tare before adding any water, you’ll target 288 grams. (That’s 18g of coffee multiplied by our brew-ratio of 16, for those keeping track at home.) Pour methods can be complex, but in general: don’t pour in a single place, don’t pour all at once, and don’t pour too close to the edge. Fancy spirals vs letters vs whatever debates are explored a bit more below. 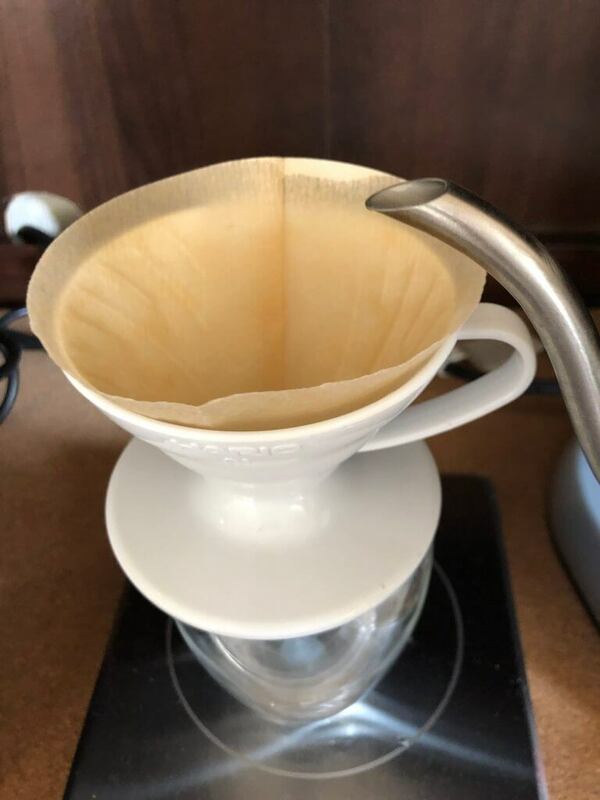 We’ll just cover a lot of things I didn’t feel we needed to cover in depth above but that’ll be quite important for someone brand new to brewing with the V60 pour over method. The thing I most quickly moved over (in #7 above) is how to pour. But it’s kind of the most mystically and possibly-complicated part of a pour over brew instruction, Hario V60 or otherwise. The primary thing I’ll say: if you’re doing the pouring thoughtfully and by hand, you’ll probably be fine. In general, though, recommendations will be that you pour water in small 50-100mL (or gram) pulses. This matches pretty well how I make myself a pour over. 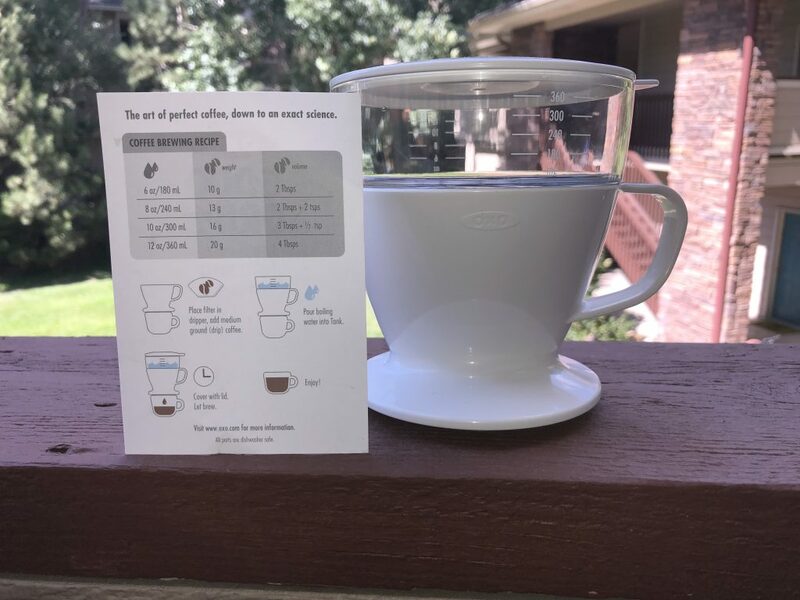 Short of an auto-drip pour over system (which exist, we reviewed the OXO), that’s the most even and easy way to do it. So if I’m aiming for the 288mL serving we specify above, I’ll probably pour about 70mLs for the bloom (step #6 above). Then for the remaining 218 grams, I’ll do roughly three pours about 70 grams each, starting in the middle and kind of circulating out. But I’m not dogmatic about it. Sometimes I’ll spell out my name, “coffee,” or some other word with the pours. Sometimes I’ll pour two small ones, then get distracted, then pour 120mL. It’s not hugely important to the final cup, in my judgement. In addition to pulsing, I do also generally think you want to make all the grounds wet all the time, and never let them run dry. This in generically the reason people advocate for swirls about 30 seconds apart in time. It’ll be the most even and effortless process. So if you’re new and just figuring out how to use a Hario V60, that’s probably the best way to pour your water. So this 16:1 ratio is important to the recipe. But it’s not set in stone. Some other nerds will brew a V60 pour over with a 17:1, 15:1 or even further afield numbers. The basic question on brew ratio is: how watery do you like your coffee? If you’re new to this, I’d say start with our 16:1 as your coffee brew ratio, but don’t hesitate to branch out from that. All that matters for you brewing your Hario V60 is your personal preferences about that cup. We’ll cover this in more in our forthcoming Hario V60 review, but the Hario brewer comes in two sizes: an 01 and an 02. As you might guess, the 02 is for more coffee (generally, more people) than the 01. 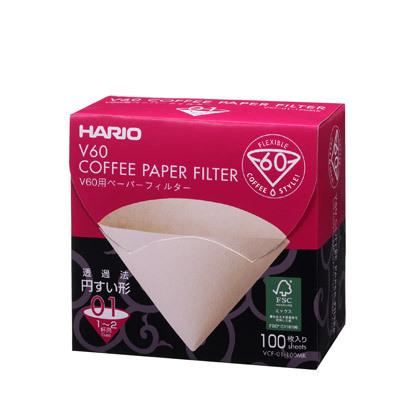 Our recipe is written for the Hario V60 01 I brew with regularly. If it matters to you mine is white and plastic. But if you’ve got a Hario V60 02, as I outline above, your brew instructions are the same. Use a 16 grind size on the Baratza Encore (or comparable on your grinder), and a 16:1 brew ratio. I’d use a V60 01 for a single-serve brew, and an 02 for up to about 750mL of coffee. Generally I see people saying that they think that max water they’ll put through the 01 is about 350mL, which feels right to me. Which Material is Best for a Hario V60? I saw Scott Rao (a bit of a luminary in nerdy-coffee circles) explain that plastic is the best for a V60 right before I bought mine. So I bought the plastic one. It was cheaper too. Materials shouldn’t matter much for Hario V60 brew instructions though. If that’s true, why does Scott say plastic is best? Simply: plastic is less thermally conductive than glass, ceramic, or (especially) metal. So you should get the warmest coffee in your finished cup with a plastic V60. Nothing more than that. There are lots of other ways to make pour-over coffee. We’ve reviewed two: the OXO Auto-Drip coffee brewer, and the Kalita Wave. Both brew about as well, and which you choose to get is just a matter of personal preference. I use the V60 more for single cup brews, and the Wave more for batches. But that’s becuase I have the Hario V60 01, and the Kalita Wave 185 (the bigger of their too sizes). I really don’t see a huge differences in the cup between the two. Both can produce excellent coffee. Brewing coffee in the Hario V60 is one of my little daily pleasures. I think it makes great coffee, quickly enough for me, and without much fuss. 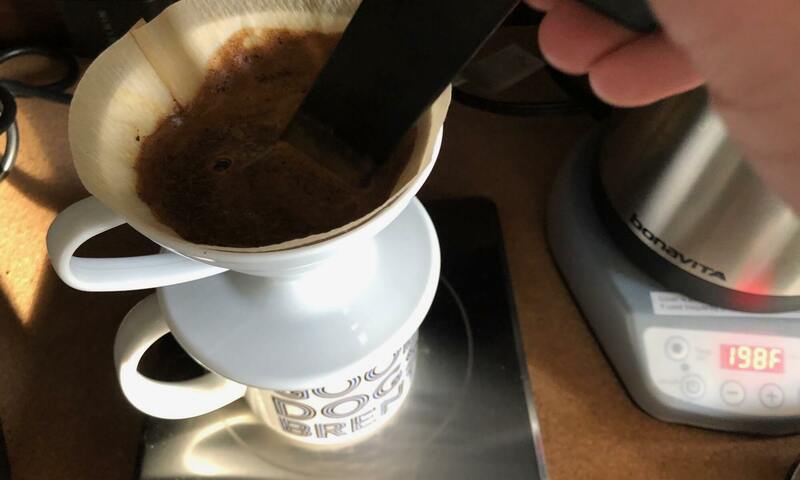 People swear by their AeroPresses, but I’m a pour-over man, and I love the results of this V60 coffee brewing recipe almost every time. Even when I think my beans are a little too old. And that’s an accomplishment.